Question 1: What is the value of [your art form]? A title like this one puts readers on notice - this poem does not take such stories seriously. Or does it? Humor is a powerful tool when you want to express something True; it's a form of "slant," as in Tell all the Truth but tell it Slant -- / ... The Truth must dazzle gradually / Or every man be blind -- . Emily Dickinson hardly ever left her room but she knew the same thing Don Raymond knows: people don't like to be challenged about what they believe. We don't like to acknowledge the amount of subjectivity built into our own world view. Then we get out into a wide open space like the Nevada grasslands and our minds start to wander, we see or hear things we can't reconcile with how we believe the world works. 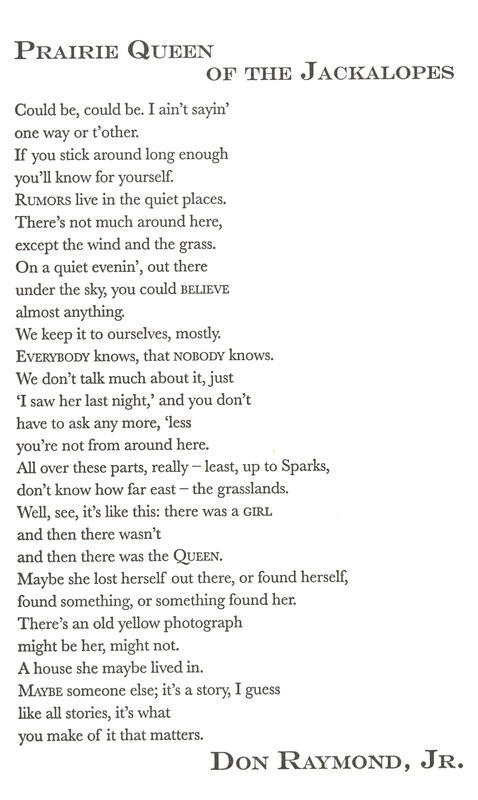 In fact, when you're alone, out there / under the sky, you could believe / almost anything. That's being human, and that's True. Don Raymond, Jr. lives in San Jose, CA, where he runs an Egyptology Museum, a fact which never fails to surprise and delight him. In what little spare time that leaves, he tutors math and science, and serves as mediator in the Machiavellian feline politics of his household. His work has appeared in Poetalk and An Electric Tragedy. He also once didn't make a left turn at Albuquerque. Questions about jackalopes, Egyptology, or chemistry can be sent to Don60223 -at- gmail.com. I'm grateful for all the poets who keep writing and sending their work. Poetry survives because we poets stubbornly continue to practice our art, in public. And public life is much richer for the effort! Poets don't pay attention to guidelines, even though they exist to save everyone time. 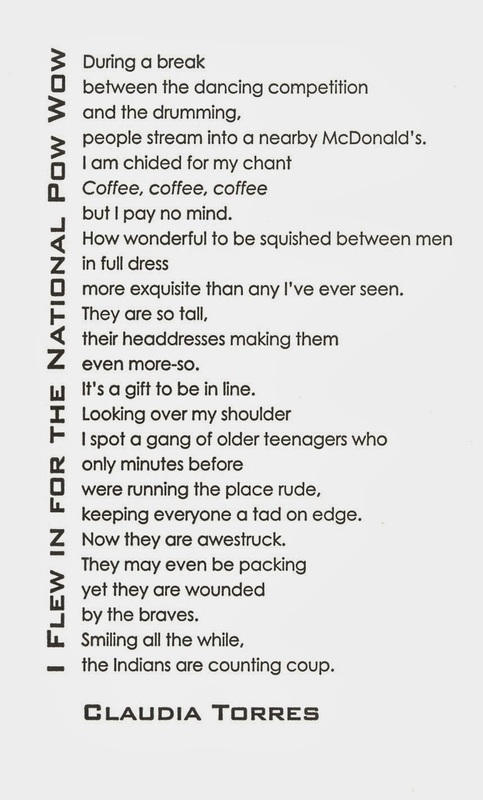 At Architrave, poems must fit on a 5 1/2 x 8 inch card, hence the 33 line limit. Submitting a poem of 10 quatrains wastes your time, because I won't read something I can't possibly publish, no matter how brilliant. Poets really love coffee. And chocolate. And cats. They love their dogs, too, but cats are favored by a wide margin. It's amazing how much devotion they inspire and how much heartbreak when they're lost! That means your poem about these subjects must be one-in-a-million, because it's got lots of competition. Poets love to talk about poems. Our art is solitary by nature, and when asked about it most of us are only too glad to have someone listen. But publishing is not a cocktail party, it's an audition; your poem must brave the spotlight alone. If you feel the need to explain it, then your poem isn't yet ready to stand all on its own against a plain, white page. Now count your lines and send me your very best work. Good luck! 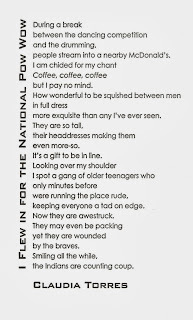 We've all been this grumpy traveler: over-hot, overtired and lugging baggage that's as heavy as this poem's long, long lines. But in that exasperated moment it's hard to grasp one's own contribution to the unpleasant atmosphere. That's when William Wordsworth's idea of poetry as "emotion recollected in tranquility" is most useful. 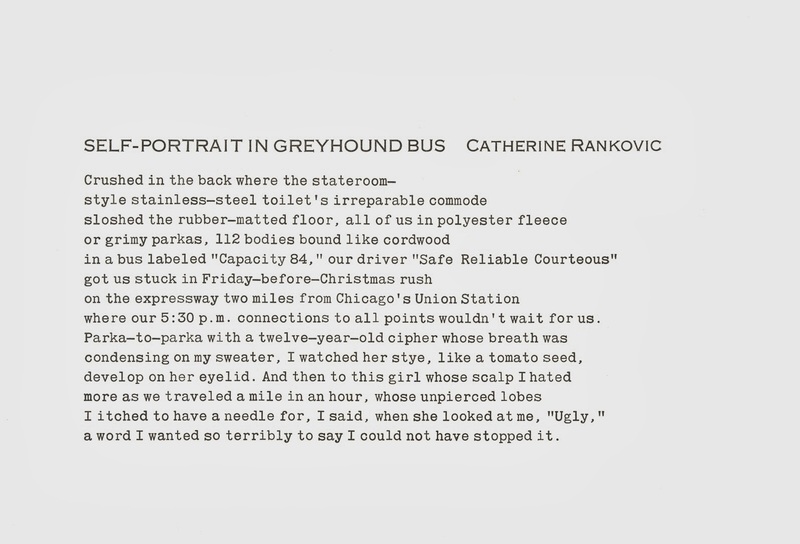 It's only afterward, when we've disembarked from the bus, after we've finished the poem - that word "Ugly" right at the end, sticking with us as we return to the title - that we make the necessary connection. 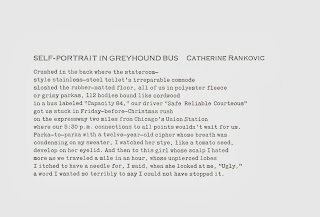 Catherine Rankovic is the author of Meet Me: Writers in St. Louis (2010),Island Universe: Essays and Entertainments (2007), and Fierce Consent and Other Poems (2005). A Pushcart Prize nominee and winner of first-place poetry awards in 2009 and 2010, she has published poems inBoulevard, River Styx, Gulf Coast, Natural Bridge, 13th Moon and other journals, and online in Umbrella and The St. Louis Beacon. She has taught university creative writing courses since 1989 and is a mentor and editor for new authors at BookEval.com. She has an M.A. from Syracuse University and an M.F.A. from Washington University. 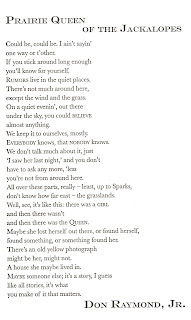 Everyone in this poem is a visitor; some are visiting from further away than others, but the scene of the poem is still populated by a random polyglot. It is a slice of the world. The majority of the patrons are anonymous, mentioned only to show how a group of rowdy teens is agitating the atmosphere. The speaker isn't exactly behaving, either, chanting for coffee. But then we meet the Indians themselves, standing in line in full dress/...exquisite. They smile, knowing they have everyone's attention and knowing they have won the room from the teenagers. It's a social game we all play, regardless of era or culture. 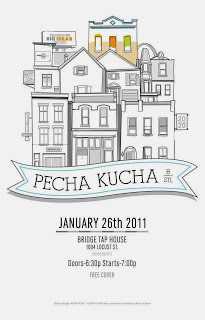 If you haven't yet been to a Pecha Kucha night (PK for short), you're missing out on something really wonderful. Each speaker has just 6 minutes and 40 seconds to tell you about their project, their passion, their hero... whatever inspires them. It's pretty hard to leave without feeling inspired yourself. For example, did you know there is a local couple who teaches people how to make musical instruments out of found objects (i.e. junk), then to play together in a jug band? It's true! Did you ever imagine that hitchhiking could be a meditative act? Myles Dickason convinced me. And the best part is that even though PK nights are an international phenomenon, each night is rooted in its own community. You might, for instance, show up to PKStL#5 and discover how that one metrolink train you'd seen sporting holiday decorations came to be. 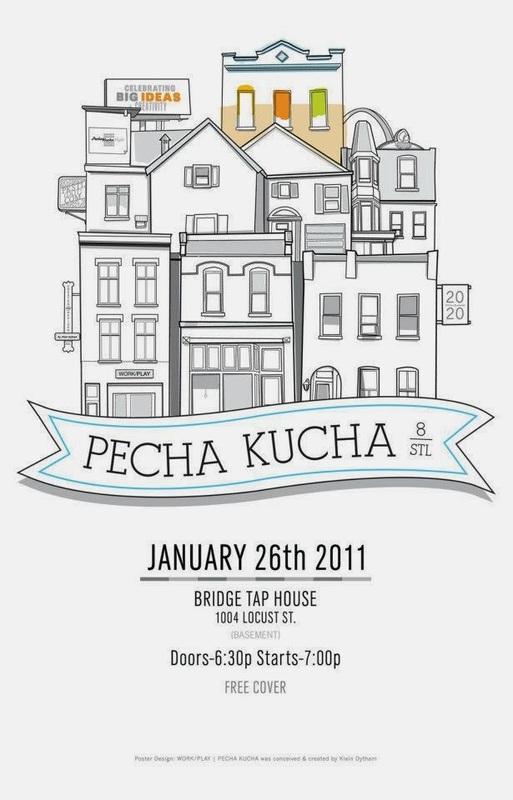 I'm happy to report I'll be a presenter at PKStL #8 on January 26, at the Bridge Tap House downtown. But don't come out just to hear me - come to be inspired by all the great people in St Louis you don't yet know about. If you want to know more, here's a succinct set of faqs from the international organization, and the website for PK in St Louis. 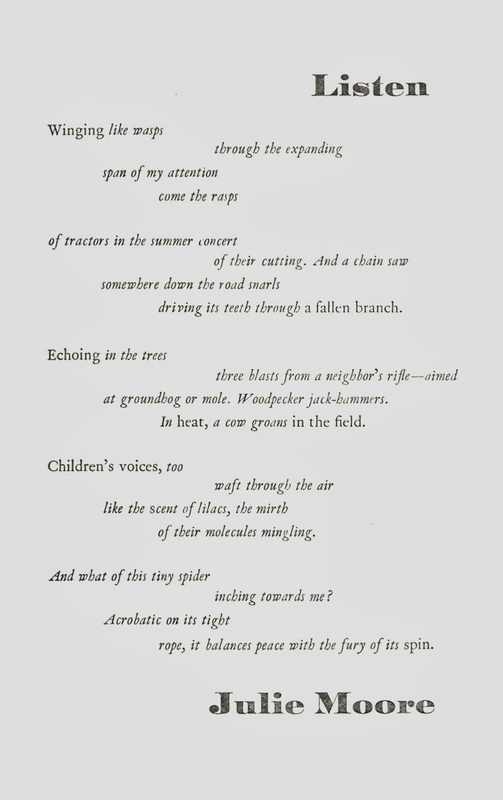 The title's imperative applies not just to the sounds described in the poem, but to the sound of the language itself. Moore has the music turned way, way up so it's easy to see how lyric poetry has its roots in song. Listen to how the internal rhymes of "expanding / span" are echoed in "rasps" and "tractors"; the u in "cutting" is an unexpected echo for "of." The repeating L sounds of "like the scent of lilacs" bleed into the m's of "their molecules mingling," making this a fun poem to say out loud. It will make your mouth work to say "trees / three blasts"; later in that same stanza "heat" and "field" require the same near-smile of your mouth. Julie L. Moore is the author of Slipping Out of Bloom (WordTech Editions) and the chapbook, Election Day (Finishing Line Press). In addition, her manuscript, Scandal of Particularity, was a finalist for the 2011 FutureCycle Press Poetry Book Prize and a semi-finalist for the 2011 Perugia Press Prize. 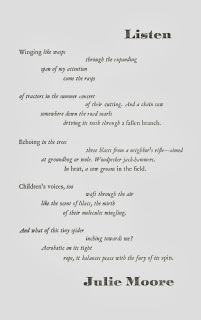 Moore has twice been nominated for the Pushcart Prize and received the Rosine Offen Memorial Award from the Free Lunch Arts Alliance, the Janet B. McCabe Poetry Prize from Ruminate, the Judson Jerome Poetry Scholarship from the Antioch Writers' Workshop, and the Paul Mariani Scholarship for Excellence in Poetry from Image's Glen Workshop. Her poetry has appeared in Alaska Quarterly Review, American Poetry Journal, Atlanta Review, CALYX, Cave Wall, Cimarron Review, The Missouri Review Online, New Madrid, The Southern Review, and Valparaiso Poetry Review. She lives in Ohio where she directs the writing center at Cedarville University. You can learn more about her work at www.julielmoore.com.